I believe that the wood oven culture will supersede the barbeque one day because of its versatility superior taste and health benefits. The food is perfumed with subtle earthy flavours and the ambience and warmth given out from the fire takes you on a journey back to traditional values where everything has a place and a time. Wood is burnt inside the oven and part of the heat generated is stored in the oven walls and in the oven floor. Once the oven has reached the required temperature cooking and baking can start. Some cooking is done with the fire still burning in the oven, the most popular food cooked that way is a Pizza but a lot more can be done with the fire still burning like pita bread, grilling (Fish, meat sausages...). Baking is done using only the heat recorded in the oven this means that coals have been removed, the floor has been cleaned (getting rid of ashes and coal) an insulated door is used to keep the maximum heat inside the oven. A Pizza oven doesn't require much insulation because the fire will compensate for the loss of heat. The wood oven requires plenty of insulation in order to keep the oven working as long as possible. 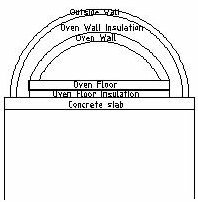 It is important to have an even repartition of heat in the oven this mean that cold and hot spots should be minimized or eliminated. - Having an external chimney. Location : I always insist that a wood fired oven should be protected from the weather at least by a roof but even better by walls. This is for your comfort as well as the oven comfort. Otherwise you will be weather dependent and your oven will accumulate humidity when not used for a few days especially when it rains and this could cause cracks when the oven is fired again. - Support : though this is not part of the oven it is required to take the load of the oven. Usually it is a concrete slab but it can be a trailer or a steel frame. - Arch : In front of the oven door supporting the chimney and protecting the exhaust fumes flow. - Arch base : Surface in front of the oven door should be easy to clean and can get quite hot. - Chimney start : 150mm diameter stainless pipe 300mm high. The above drawing shows a curved outside wall which is a personal preference but you can choose your own exterior as it is esthetic only and doesn t impact on the efficiency.